Bursting onto the American music scene after signing with Capitol Records in 1950, the raven-haired Sumac was known as the "Nightingale of the Andes," the "Peruvian Songbird" and a "singing marvel" with a 4 1/2-octave (she said five-octave) voice. Here is a fantastic song, typical of the style of the divine Yma Sumac, gifted with an incredible voice (with a range of 5 octaves). Enjoy the magic of the Inca princess! 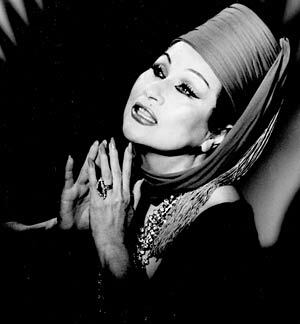 LOS ANGELES --- Yma Sumac, the Peruvian-born singer whose spectacular multi-octave vocal range and exotic persona made her an international sensation in the 1950s, has died. She was 86. "She warbles like a bird in the uppermost regions, hoots like an owl in the lowest registers, produces bell-like coloratura passages one minute, and exotic, dusky contralto tones the next." Sumac's first album for Capitol, "Voice of the Xtabay," soared to the top of the record charts. A handful of other albums followed during the 1950s. With her exotic beauty, elaborate costumes and singing voice that could imitate the cries of birds and wild animals, the woman who claimed to be a descendant of an ancient Incan emperor offered Eisenhower-era audiences something unique. During her 1950s heyday, Sumac sang at the Hollywood Bowl, Carnegie Hall and Royal Albert Hall. She reportedly made $25,000 a week in Las Vegas. 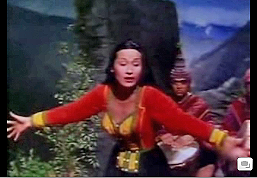 She was featured in the 1951 Broadway musical "Flahooley" and appeared in the films "Secret of the Incas" in 1954 and "Omar Khayyam" in 1957. Although details of her birth date and early life vary widely, Devine said Sumac was born Zoila Augusta Emperatriz Chavarri del Castillo in Cajamarca, Peru, on Sept. 13, 1922. Sumac said she began singing when she was about 9. After joining Vivanco's large group of native singers, dancers and musicians, she made her radio debut in 1942; she and Vivanco were married the same year. In 1946, she and her husband moved to New York City, where they performed as the Inca Taky Trio, with Vivanco on guitar, Sumac singing soprano and her cousin Cholita Rivero singing contralto and dancing. After making her name as a solo artist, Sumac toured around the world for several years in the '60s, but her popularity in the U.S. had waned by then. In 1971, she recorded a psychedelic rock album, "Miracles," that was not widely released, and semi-retired to Peru later in the decade -- at least that's what she always said. "That's the legend that she stuck with all through these decades," Devine, who runs the Sumac website www.yma-sumac.com, told The Times in June. "She didn't want people to know she was here and not working. The story was good for her. She's a very eccentric woman. . . . Her whole career and life is based on her mystery, and so the facts and fiction is a fine line with her." Sumac, however, did return to performing in 1984 at the Vine Street Bar & Grill and the Cinegrill in Hollywood. In the early 1990s, she toured in Europe and continued to perform until 1997. "The younger generation loves the music, loves Yma," Sumac told the Tampa Tribune in 1996. "The new generation told me many times: 'Miss Yma, we love you. Your music is something. It's out of this world.' "
Sumac, who was divorced from and remarried to Vivanco in the late '50s and divorced from him again in 1965, is survived by their son, Charles, who lives in Europe, and three sisters, who live in Peru. McLellan is a Times staff writer.